Kelly Chandler-Olcott, professor and chair of the Department of Reading and Language Arts in the School of Education, and Eileen Schell, associate professor in the writing program in the College of Arts and Sciences, will be named as the 2015-16 Laura and L. Douglas Meredith Professors of Teaching Excellence at a ceremony on Monday, April 13, at 4:30 p.m. in Goldstein Alumni and Faculty Center. In addition, seven non-tenured faculty members will be given Meredith Teaching Recognition Awards. They are Katie D. Cadwell, Diane Canino-Rispoli, Lauryn P. Gouldin, Laurie Marhoefer, Dana Olwan, Evan Weissman and Raymond M. Wimer. Lawrence Mason will be named the 2015 United Methodist Scholar-Teacher of the Year. A substantial bequest from the estate of L. Douglas Meredith, a 1926 graduate of the College of Arts and Sciences, allowed for the creation of the Laura J. and L. Douglas Meredith Professorships in 1995 to recognize and reward outstanding teaching at the University. The awards recognize and reward excellence in teaching, encourage faculty members to look upon the many dimensions of teaching as manifold opportunities for constant improvement, emphasize the great importance the University places upon teaching, and improve the teaching and learning processes on campus. The Meredith Professors receive a supplementary salary award and additional funding for professional development for each year of their appointment. Kelly Chandler-Olcott teaches reading and language arts; but more than that, she teaches about teaching; and even more than that, she teaches about reaching your potential, and building a better world. That’s what she hopes, at least, and her students believe she succeeds. To achieve those objectives, Chandler-Olcott “routinely co-teaches with her doctoral students and has conducted research for four years into the co-teaching and co-planning processes associated with her direction of the Nottingham Summer Writing Institute, a three-week program offering enrichment for youth and professional development for secondary teachers,” says School of Education Dean Joanna Masingila, who nominated her for the Meredith Award. 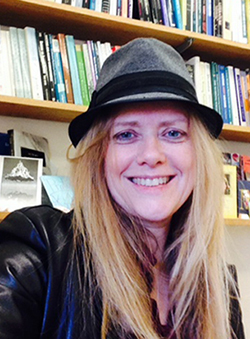 During 2012, Chandler-Olcott spent a sabbatical co-teaching a ninth-grade English class in a local high school “as part of her commitment to ensuring that our teacher education programs and her own research are well-informed by the complex realities of today’s K-12 schools,” says Masingila. One of Chandler-Olcott’s signature courses is on assessment, SED 415/615, and because of that she feels that she must model model the assessment process in the best way possible. “Not only do I need to assess my own students’ learning sensitively and thoroughly, drawing on multiple data sources, but I also need to ensure that they can do the same for the adolescents they teach,” she says. Chandler-Olcott has taught at the School of Education since 1998, where she has been active on various committees and has served as chair of the reading and language arts department since 2008. On the larger campus, she is a member of the Fast Forward Operational Excellence team and Associate University Marshal since 2012. She is the author of five books and more than 65 chapters and articles. For her Meredith project, Chandler-Olcott will design a new course that will serve two purposes. It will be an introduction to the field for undergraduates entering the School of Education’s teacher education programs, as well as an elective for students from across campus with an interest in education theory, practice and policy. The course will be team-taught by faculty from multiple disciplines, and will use various media and guest speakers to bring in multiple viewpoints on current educational issues. Eileen Schell doesn’t want writing to be just another chore for her students. “I want to instill in my students a sense that developing as writers, as communicators, is an urgent, necessary and life-altering act,” she says. Schell’s contributions to the writing department include designing its creative nonfiction course, in which students take their first steps in writing in the genre. In 2007, she established the Nonfiction Reading Series to bring prominent writers to campus to share their work and meet with students. Schell received the Graduate Mentoring Award from the University’s Composition and Cultural Rhetoric Graduate Circle in 2012 and the Faculty Inspiration Award from the Center for Public and Community Service in 2008. She also received the University’s Excellence in Graduate Teaching Award in 2005 and she was part of the service learning project in the Writing Program that was awarded the Chancellor’s Award for Public and Community Service in 2000. This past fall, she was asked to be a core member of the Renée Crown Honors Program faculty. Schell shares her teaching skills with the wider community as well. In 1999, she established the Nottingham Senior Living Community writers’ group, and in 2010 she started the Syracuse Veterans’ Writing Group; she continues to work with both. The veterans’ writing group inspired her to create her Meredith project, “Reading and Writing War: The Long Trail of Memory.” The project will consist of two components: first, a three-part series of forums that involve panel discussions and readings of original works by veterans and refugees or survivors of war; and second, an honors 300-level course on “Read and Writing War” that will run concurrently with the forum series and be intertwined with it. Students will be involved with forums, including publishing a book of the forum proceedings. The Board of Higher Education and Ministry of the United Methodist Church sponsors the University Scholar/Teacher of the Year Award at Syracuse University annually since 1982 to recognize the teaching and scholarship of an outstanding professor. This award gives explicit emphasis to the dual nature of a faculty member’s responsibilities as a scholar or creative artist and as a teacher. The award carries a stipend of $2,000. Lawrence Mason has been asked to chair his department several times, and each time he has politely declined. Teaching, he says, is his first passion, and his own creative work comes a close second. Both of those passions have been united in a third: telling the story of the Pan Am 103 bombing and honoring its victims. Mason taught eight of the 35 Syracuse University students who died in the bombing, and in its aftermath, he served as one of the primary public faces of the tragedy, giving interviews, welcoming the families of the victims and participating in Remembrance Week activities. He was the lead author of a book about the bombing and its aftermath, “Looking for Lockerbie” (Syracuse University Press, 2008). He served on the planning committee for the University’s Pan Am 103 25th anniversary commemoration and produced three photo exhibitions that were shown during the anniversary year. He is in his third year as a member of the Remembrance Scholar selection committee. He is currently working on a documentary photography project about Lockerbie that will be exhibited in the British House of Commons later this year. And he has taken more than 100 students to Lockerbie over the years. The Teaching Recognition Awards program was established in 2001 through an expansion of the Laura J. and L. Douglas Meredith Professorship Program. The Meredith Professors themselves proposed that the Teaching Recognition Award program recognize excellence in teaching by non-tenured faculty and adjunct and part-time instructors. Recipients are selected for teaching innovation, effectiveness in communicating with students and the lasting value of courses. To be eligible, candidates must have completed two years of service to the University and not yet received tenure. Each recipient is given $3,000 to further his or her professional development. Cadwell completely redesigned the two major chemical engineering laboratory courses in the program to focus less on following directions and more on working in teams, designing experiments and learning to work with diminishing guidance. She is committed to faculty development, establishing a monthly Teaching and Learning luncheon series for faculty. She also coordinates a seminar series that invites high-profile speakers in engineering education to lecture and interact with faculty. Cadwell was one of the inaugural winners of the Dean’s Award for Excellence in Engineering Education. She was also named the Technology Alliance of Central New York College Educator of the Year last spring. Canino-Rispoli has taught for more than 20 years in the certificate of advanced study program in educational leadership. She currently serves as the program’s coordinator, and advisor to nearly all of its students, which currently number more than 80. Most of them are pursuing the CAS part time while teaching full time, so she schedules sessions with them in the early mornings, late afternoons and evenings and on weekends. She restructured and strengthened the School of Education’s administrative internship program, helping it to thrive in an era when many other such programs have struggled. She and a colleague have been key in developing a series of simulations to help leadership candidates gain experience in dealing with difficult situations. She is now helping to extend those simulations to other groups of students. Gouldin is in her third year as an assistant professor in the College of Law. She teaches three larger survey courses and advises several second-year students as they draft their student notes. 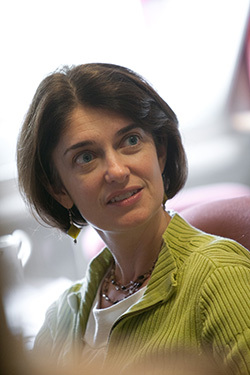 Her aims, she says, is to “convey what I genuinely believe: the law, while frustrating in its imperfections, is a joy to study, a privilege to practice and a work-in-progress that is theirs to improve.” One of the ways that Gouldin uses to keep her students engaged during class time is through the use of Response Ware, a classroom response system that allows her to pose questions to the class on a PowerPoint slide, solicit responses from students via their laptops or phones, and instantly display the results. These polls allow her to test students’ understanding of the material, react immediately when areas of confusion are identified and gauge students’ opinions on relevant issues. “What I want above all from my students,” says Marhoefer, “[is] not just that they think for themselves, but that they think well for themselves. She wants them to use analysis and evidence to back up their arguments and to express their ideas effectively. Marhoefer’s specialty is Weimar Germany and the history of sexuality, but perhaps her most popular course is “Nazi Germany and the Holocaust.” When she first started teaching the class, it typically enrolled 40-50 students, but now has 150. “I worked for many years to develop the skill of being able to lecture well to a large class,” she says. She takes an equal amount of pride in teaching smaller classes and seminars well. She observes the classes of colleagues who are known as good teachers in order to pick up new techniques. “I believe that no education is neutral,” Weissman says. “It either reinforces or challenges the status quo. As a scholar of food, I make my goal of social change transparent and encourage students to participate and lead in change efforts.” One of the methods Weissman uses to encourage these efforts is community involvement. Students in one of his courses took part in My Lucky Tummy, a pop-up food court celebrating the refugee and new American community, and worked alongside chefs from Eritrea, Japan, South Sudan, Iraq and Bhutan for no pay or credit. Students in his “Urban Food Systems” class have done a community food assessment, working alongside the Onondaga County Planning Agency. His students have previously worked with such community entities as Nojaim Brothers Supermarket and the Southwest Community Farm.